Broadband Impact and Market Assessment: Custer County | Strategic Networks Group, Inc.
Custer County Economic Development Corporation (CCEDC) was concerned about the future employment opportunities and economic viability of Custer County. As a small, rural county with an aging population in natural population decline, Custer County, Colorado, needs net inward migration to avoid social and economic decline. Even with significant annual inward migration (i.e. 3.6% per annum) the county will remain relatively small and rural. Despite Custer County’s many assets as a place to live, without world class digital infrastructure attracting businesses and population into the county from urban centers will be a major challenge. In order to maintain and grow the local economy in a managed way, Custer County must leverage its assets and opportunities to attract key demographic groups, especially younger, mobile professionals and affluent retirees or those close to retirement (already a significant demographic for Custer County). The forward-thinking leaders at the CCEDC recognized that without full coverage of broadband the county will struggle for survival and they had already established a plan to build capacity on six wireless towers throughout the county to provide coverage to 80% of locations and improve service to the 40% already covered. The challenge was to secure the required funding to implement the plan. 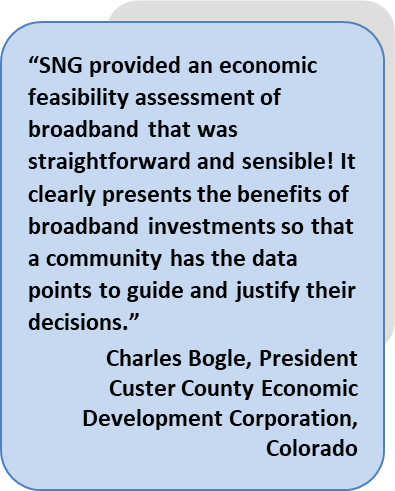 The CCEDC contacted SNG to conduct a Broadband Impact Assessment of Custer County. The scope of SNG’s work was expanded to collect data on expected job impacts if Custer County were to receive an additional $1 million in Federal Economic Development Administration funding for the six new wireless towers that would increase the broadband service footprint to nearly 80% of county addresses. The project scope was expanded for SNG to include collection of market assessment data based on the commitment and support of CCEDC. SNG worked with CCEDC between March and June 2018 to gather input locally on how local businesses, organizations, and households are connecting, using, and benefiting from the internet. The survey campaign was promoted as – “We asked and we listened”. In April and May of 2018, 742 households and 709 organizations were emailed. 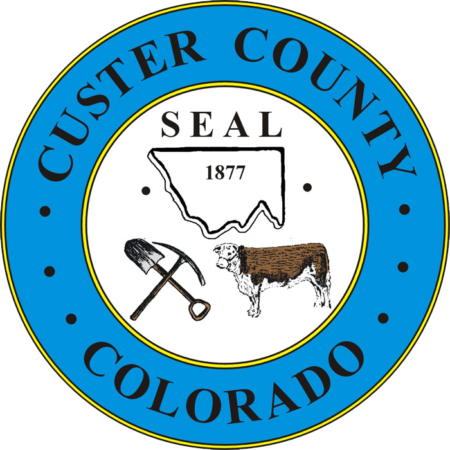 Responses from 164 households and 80 organizations were received, which represents approximately 8.5% of Custer households and 10% of Custer businesses. Those results are compared to the SNG Digital Economy Database (DED) for rural areas, representing 10,600 households and 5,900 organizations. Detailed analysis of the research combined with SNG’s extensive DED and experience were documented in a Broadband Impact and Market Assessment Report that was the basis for submission for securing the needed funding of Custer County’s broadband plan. A growth of 191 jobs over 10 years, which is significant in terms of the current base of 1,500 jobs. The addition of 50 employer establishments over 10 years on a current base of 140 establishments. The retention of 20 existing businesses that planned to relocate out of county because of the lack of broadband. An increase of 430 teleworkers and 773 home-based businesses over 10 years as a result of broadband. Additional findings and results are detailed in the Custer County Broadband Impact and Market Assessment Report. As a result of SNG’s research, analysis, and report the CCEDC obtained the endorsement of their funding request from the Governor of Colorado and met the Federal Economic Development Administration to receive the funding needed for their broadband implementation.